How many times have you heard how impossible it is to teach writing? Technically, it is possible. After having enough practical classes and learning about writing patterns, everyone can learn to write well, but there's a catch. Everything is in the hands of the learner. The lion's share of good writing belongs to student efforts. How can they write beautifully if they rely only on their teacher? Daily practice, reading, and learning something new are the things that force self-evolution. With a carefree attitude, progress will remain elusive. Establishing a friendly environment in the classroom matters a lot. And sometimes the thing that motivates students to write can be a reward. Let's say, for example, that the best fictional piece of writing is published in the school newspaper. Getting published can be a powerful source of motivation to work on one's writing. You should also guide students on building positive motivation on their own. After all, you can only assist them when you have them in your classroom, not the rest of their lives. How can a person who doesn't write anything teach others how to write? Read to your students from your own works, such as short stories or anything else, and then analyze them together. Discuss how you handled narration, the motive of the story, what symbols students notice, what stylistic means were used, where was the climax of the story, and so on. Tell students what you were thinking about when as you wrote the piece and how you managed to introduce your ideas in the text. Some consider reading to be a lazy learning method, but that's not the case. When students enjoy absorbing story plots and experience new things through the lives of the fictional characters, they are without doubt learning. The more they read, the more information they learn about writing styles, structuring text, using stylistic devices, and many other things. To make reading even more exciting, organize a book club where everyone reads the same book; then discuss the details together. Public sharing of one's thoughts is a huge plus for those who write. The clearer a person talks, the clearer they will write. Though students read a lot (since you've accustomed them to reading) and learn about different writing styles, they'll probably imitate their favorite ones. This can be quite dangerous. First, it can easily turn into plagiarism. Secondly, it can damage the development of one's own individual writing style. Though a student's writing voice may not be strong at present, teachers should make sure students work on developing their own manner of writing. Students should remember that it's their writing, and they are free to express themselves however they wish. But there's a number of things (let's call them "things" instead of "rules") that make one's writing more attractive. For example, don't use too many adjectives and adverbs. Use active voice instead of passive voice. Show, don't tell (e.g., Barbara was telling her friends that Steve is a waste of space instead of Barbara disliked Steven). Avoid clichés. Ask your students to start journals for their writing. This will be their own writing space, where they do exercises, free-writing, experiments, and note down tips and hacks provided by the teacher. 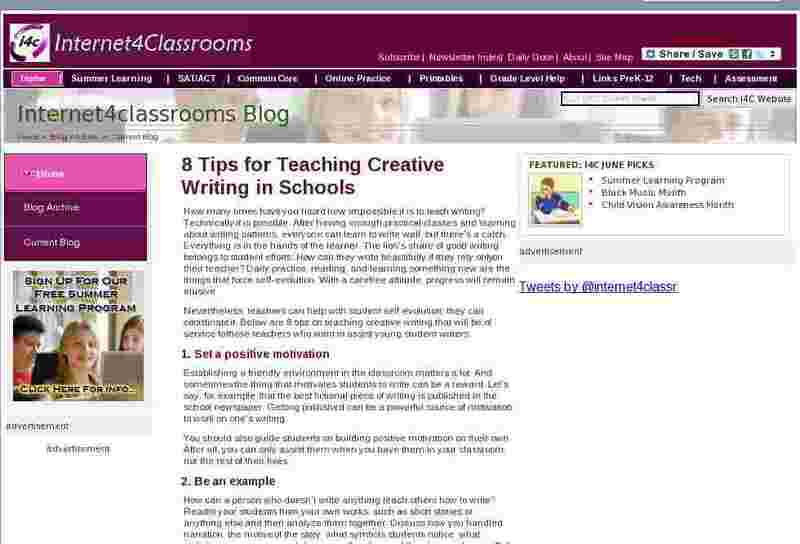 Prepare your own writing exercises or search for relevant ones on the Internet. Good starting points are websites focused on writing, such as WritingExercises, Writer's Digest, and EnglishForEveryone. OmmWriter is a resource that helps people concentrate on what they're writing by means of pleasant backgrounds and audio tracks to accompany one's efforts. Hemingway Editor lets writers avoid hard-to-read sentences, passive voice, and too many adverbs. You're responsible for what you teach, right? But don't forget that your students are just starting to develop their own ways of writing and need a helping hand and positive motivation more than fierce criticism. They're going to meet lots of critics who are all too ready to sting young writers. You needn't be one of them. Rose Scott combines tutoring and freelance writing. She is addicted to teaching and can't imagine her life without writing. She taught Literature for more than four years. Rose welcomes your linguo-stylistic questions and will be glad to help you with literary analysis. The secret of her perpetual inspiration is morning runs. Connect with her on Facebook and Linkedin.